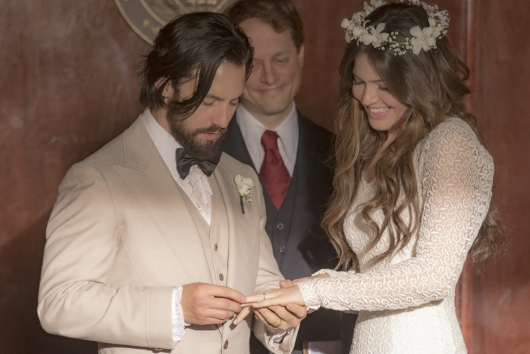 This Is Us 1.14 “I Call Marriage” review: The Past: Rebecca and Jack (Mandy Moore, Milo Ventimiglia) got married! As Miguel (Jon Huertas) makes the best man speech, we catch glimpses as scenes of the passion, sickness, and laughter of their marriage. I already know I am in for big cry at the end of this, so buckle in. 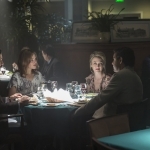 The scene switches to Miguel and his wife with the Pearson couple out to dinner, when Miguel says they are getting a divorce. Jack worries that he and Rebecca are drifting too. He confronts Miguel at work, wanting to know to know what really happened, but Miguel explains it was just drifting. Rebecca calls Jack a superhero to her bandmate, so there is no drifting there. Jack surprises her with a night at their very first apartment. He really is the perfect husband. The Present: Randall (Sterling K. Brown) has a nightmare of William dead, and wakes up to his daughter and William playing chess at 3am. Kevin talks an old couple into moving to a different booth in a diner, so he could sit there with Sophie (elementary school trip nostalgia). She comes in yelling but gets sucked in by fries. Can’t blame a girl. 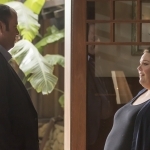 Kate (Chrissy Metz) is walking at fat camp – 10 miles (so much more than I can do). 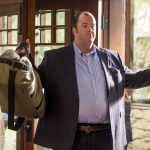 Toby comes and surprises her with a night at a hotel, but he doesn’t want to impede her progress. The guy who had been flirting with her, Duke (Adam Bartley), gave a hint to Toby. He decided to join, but cracks jokes and makes Kate mad. He gives her an engagement ring and walks away. Randall and Beth (Susan Kelechi Watson) meet about palliative care for William, and Randall is freaking out. He gets to work and his boss puts his rival on an account with him. Beth calls “marriage” because he cannot miss his kid’s chess tournament. His boss gives half his accounts away. 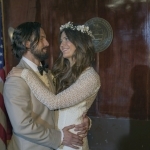 It ends back in the past with Jack and Rebecca reading their vows, as his present children deal with their stuff – Kate about to have an affair, Randall with shaking hands because he can’t hold it together, and Kevin, so happy because Sophie walked in that door. I did cry (it’s a requirement), but not as much as I thought I would. I am really upset with Kate. She is being selfish. Does she think men like Toby grow on trees? I just hope that she turns away from cabin 13 or goes there and tells Duke off. Kevin is really sweet. I’m pissed that he cheated, but I think these two belong together (which was a total surprise after the Sloane/Olivia thing). Randall is not good. I just wonder if they are going to tie it in with Jack’s death. Did Jack die of cancer? Beth mentioned it was sudden, but they could have shielded the kids from the long truth. Whatever the story is, we will surely need several boxes of Kleenex for THAT episode. 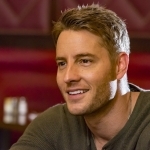 This Is Us airs Tuesday nights at 9:00pm ET on NBC. 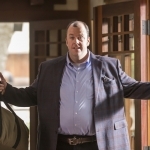 Toby throws a wrench in Kate’s weight loss journey. 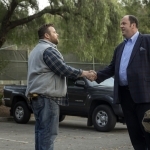 Randall struggles to accept his father’s deteriorating health. Miguel and Shelly break some devastating news to Jack and Rebecca, which makes them worry about their own relationship. Rebecca receives an amazing work opportunity. Kevin examines his romantic past.